Manchester City top the Premier League with a staggering 29 goals after just eight matches. They have been the best side in the division and look like probable champions. Compare and contrast this to how they did last season. They finished third and had issues across the park. While they often looked good, they regularly looked just as bad, particularly at the back. So what has changed? How are they doing so much better? And what genius ideas has manager Pep Guardiola implemented to make this side one of the most beautiful to watch in Premier League history? Over and over again, City seem to seek out one position on the pitch. There's a gap in the space behind the full back and centre back in most defences. It's a difficult place to find because an outstretched leg or a clever block can easily stop a ball from reaching it. Watching them it's difficult not to notice it. 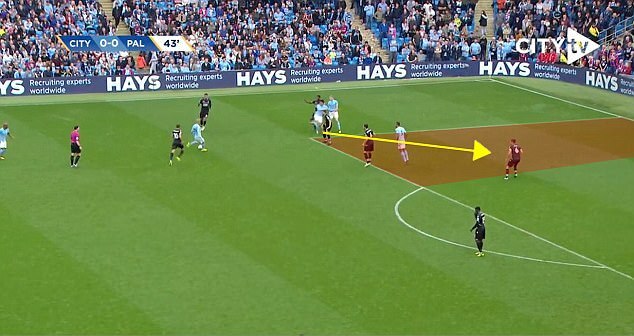 Their players constantly seek out this spot, that perhaps could be called 'the pocket'. This is a golden space in the box. What makes it so incredible is it is one of very few areas in the final third of the pitch where there is always space. No defence will try and have a line that starts deeper than just inside their own box. Doing that would just open up chances to shoot. It does mean that there is acres of space to work with, but few teams can manage it. It's incredibly difficult to defend against a player once they are in there. And City can find players in there because of the quality of their passes. A bad tackle and a defender gives away a penalty. An ill-judged move and a player can have a shot. Give too much space away and a low cross can be played. 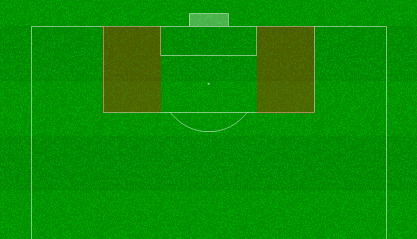 Their players also constantly make runs into this space. Against Crystal Palace, Leroy Sane was where you would expect a winger to be - out wide. 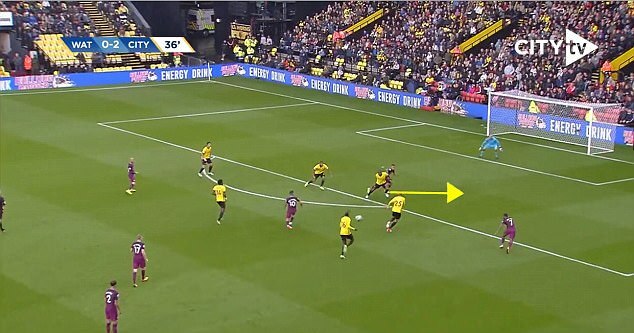 He spotted David Silva with the ball at his feet and began to make a run into that very space. Silva, with his brilliance, played a flicked pass over the top. Sane beat Scott Dann, who could have done very little differently, before firing the ball under Wayne Hennessey to open the scoring. 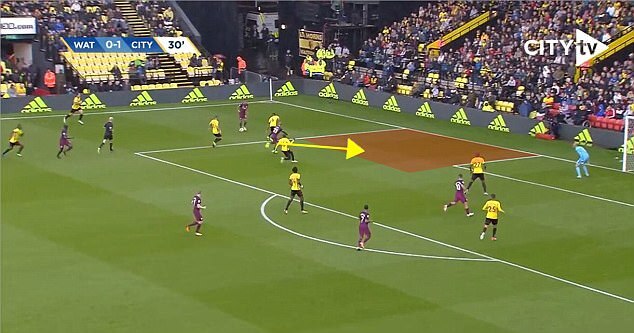 In the Watford game Silva made a similar run but into a much smaller pocket. A player with his talent with the ball can still operate there. He received the ball. He crossed it low. Aguero stuck the ball in. There is absolutely no stopping it, as Watford, one of the Premier League's best sides so far this season, found out. 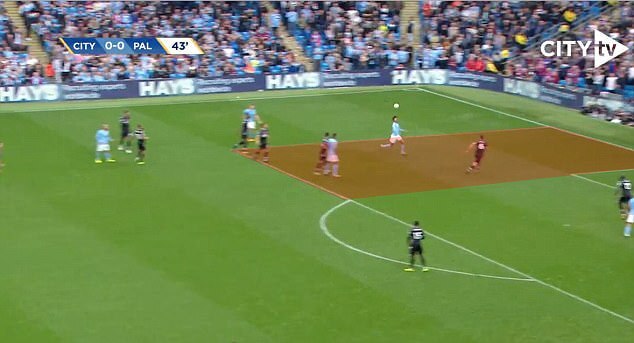 The use of this space is why City have scored more goals from crosses - six - than any other team in the Premier League this campaign. Most of them have been low and come after finding space in the pocket. It looks so easy because it is simple football, but going into it is a combination of brilliant running lines, incredible passing and a fundamental understanding of what works best. In Kevin De Bruyne and Silva, City have two of the most talented central midfielders - with a unique skillset - in the Premier League. These are two players who feature in the No 8 role, who can do everything - they are a combination of deep-lying playmaker, No 10 and winger. This comes from the fact that both players spent their formative years playing out wide. City splashed the cash on De Bruyne after a brilliant year on the wing for Wolfsburg. But playing De Bruyne out wide should be a sackable offence. Both players have an incredible eye for a pass, can drive teams up the park and have, as has been demonstrated this season, an impeccable sense of when to time a run. They are always willing to get into the area and support the striker. Few midfield combinations in the top flight would also be able to play the passes they do to find people in 'the pocket'. And this creativity in the centre is backed up by the brilliant Fernandinho, the best and simultaneously the most underrated pure defensive midfielder in the league. But their experience out wide gives City an important Plan B. Given Raheem Sterling and Leroy Sane - never mind the full backs - often come inside to find space in that gap behind the defence, City could find themselves playing overly narrowly. They don't - thanks to Silva and De Bruyne. When they need to go wide, they go wide, stretching the defence. With players coming in and out, it is a nightmare for a defensive line to deal with. Against Chelsea, City's toughest test yet, runs out-wide by De Bruyne and Silva meant the hosts were pinned in. Their defensive three became a five and at that point City were always likely to win. City even have back-up in this role. Bernardo Silva spent much of last season playing wide for Monaco but is earmarked as his namesake's long-term replacement in the centre. He'll do well to get past David, who is only not the focus of attention this season because De Bruyne has been so brilliant. Look at where Kyle Walker is at the start of this attack. Where would you expect him to run? Your answer is probably not inside the pitch. Last season, City had a paucity of good options at full back but Pep Guardiola still tried something maverick. 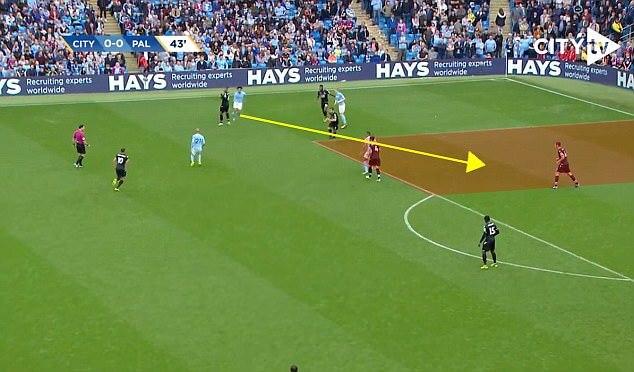 Often Bacary Sagna and Aleksandar Kolarov would come inside as the team advanced up the pitch and Fernandinho would drop into defence, essentially creating a 3-2-2-3 while going forward. That is an old school W-M formation, not seen in the English game for over half a century. Guardiola is bringing it back. His full backs do not necessarily have to run wide, although they are allowed to do so. 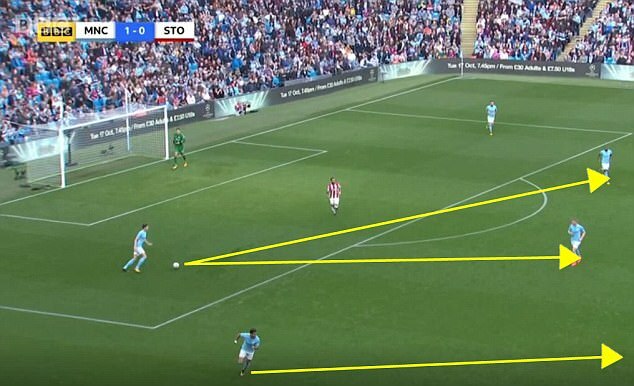 Sometimes, with De Bruyne and Silva spreading wide, the space is through the centre. City had to have players who can exploit it. This is why Guardiola spent so much money on Walker and Benjamin Mendy. 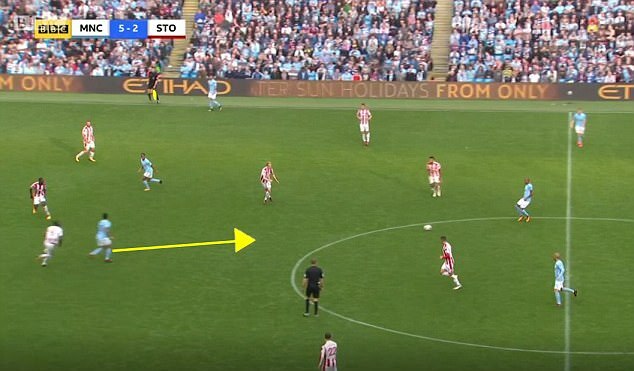 In this particular passage of play against Stoke, the England international knows exactly where to go. His Belgian team-mate is wide. Sterling is heading into the middle to wait for the inevitable low cross. Someone has to be in the pocket to play it. That's where his run is. 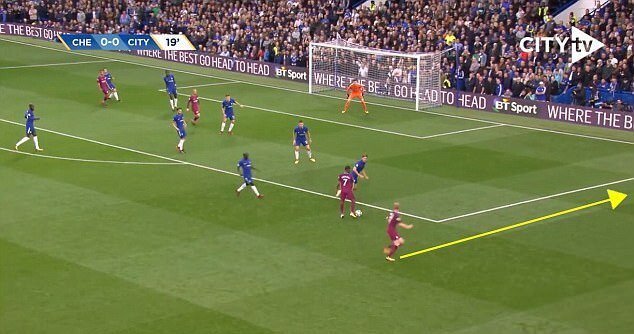 That means when De Bruyne looks up for the pass, there is a man bursting perfectly into space in front of him. He finds him, Walker crosses it low and Jesus scores. Easy but complex. Walker is also comfortable carrying the ball into the centre of the park and driving the team forward. He did that against Chelsea because, again, there were players doing what he might otherwise do - stretching the play. 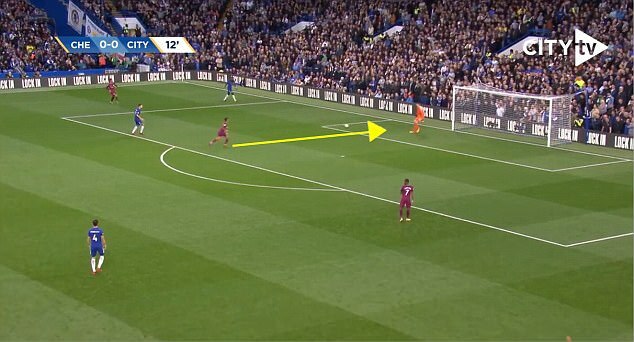 It is also why having Fabian Delph as a backup left back is no bad thing. He is, by trade, a central midfielder, but has all of the physical attributes and defensive ability of a full back. That means he is comfortable playing the role that Guardiola demands of him - one that essentially encompasses both positions. Chalk this up as another reason why it is so difficult to defend against City. It's almost impossible to tell which players will run where. All of this makes City an incredibly attacking side, best borne out by the fact they are breaking records for the number of goals scored by this stage of the season. There are players running from every position, which could come at the expense of some defensive organisation. City, though, have methods of ensuring their defence does not collapse as everyone pushes forward around them. The first is the Guardiola special and why his Barcelona team were so brilliant - pressing from the front. Look at this situation for Chelsea. This is the 12th minute of the match against City and the defence seems to be under absolutely no pressure. They have passing options. But Jesus will not let him rest. 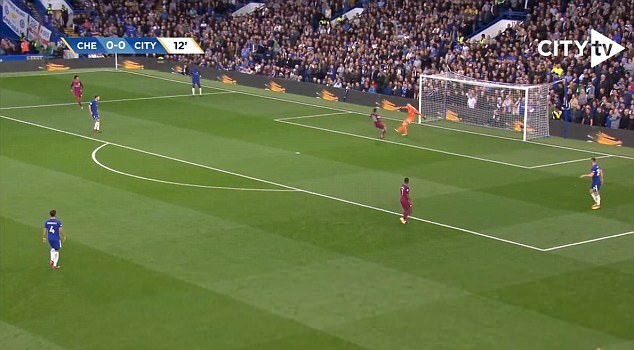 He, unlike Aguero, is a fine presser and charges for the Chelsea goalkeeper once the ball is played inside. His pace means he nearly forces a goal out of a completely innocuous situation. For the rest of a long 78 minutes, Chelsea will think twice about playing out of the back. Courtois will punt it. That means City will consistently get the ball back whenever a chance breaks down because opponents are forced to go long. Chelsea only completed 79 per cent of their passes against City, compared to 86 per cent as the away side at Stoke, or the same figure against Everton. It is a significant drop off. 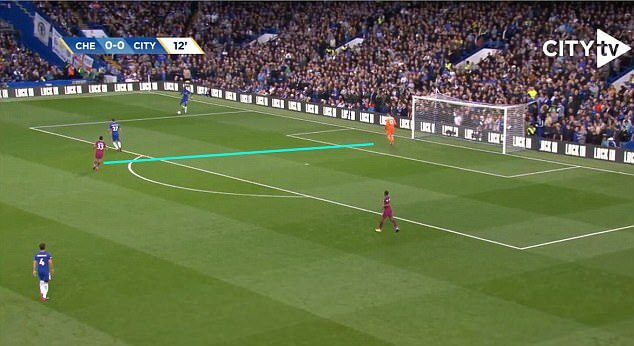 Forced long passes are then allied with City's incredible ball retention. No team in the Premier League has completed as many of their passes as City - 89 per cent. No team plays more short passes than City - 93.39 per cent. And no team plays fewer long passes than City - 6.61 per cent. That means they keep the ball and win it back quickly. Which results in the opposition being able to create very few chances against a team that is ostensibly very attacking. City have only faced nine big chances on their goal this season in the Premier League. Only Tottenham Hotspur have faced less and that is the same figure as West Brom, a team that puts so much emphasis on being tough to break down. Guardiola's side have gone from being one of the loosest teams in terms of allowing chances to being one of the tightest. That is not just reliant on their defence but the whole side defending as one. There is a reason why Aguero is not being rushed back into the side after his accident in Amsterdam. Jesus suits City's system far better than the Argentinian. He can do absolutely everything that Guardiola demands of him. He presses from the front, as mentioned, but also drops deep and links up play brilliantly. 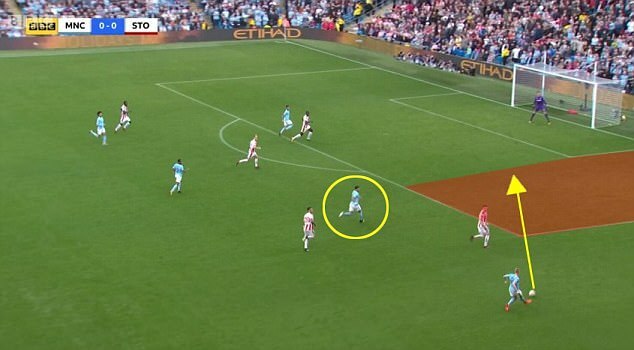 And then his runs in behind give City players an option for their excellent through balls. Add in the fact that he's an excellent finisher and it's easy to see why Guardiola prefers him. Aguero is a great goalscorer but does not have all of these tools in his locker. So many sides play with a No 10 these days. City don't need one - Jesus can play as a striker, attacking midfielder and first line of defence in one go. 'The key to all of this is we have fantastic footballers,' Guardiola argued. 'No coach, least of all me, works miracles'. These were the words of Pep during his time as Barcelona manager, when he was crafting a team unlike any other seen before and getting all of the credit for it. Fundamentally a lot of what he is able to do with City is because he has players who understand and can implement a succession of complicated instructions. They also have the technical ability to be able to do the unthinkable. 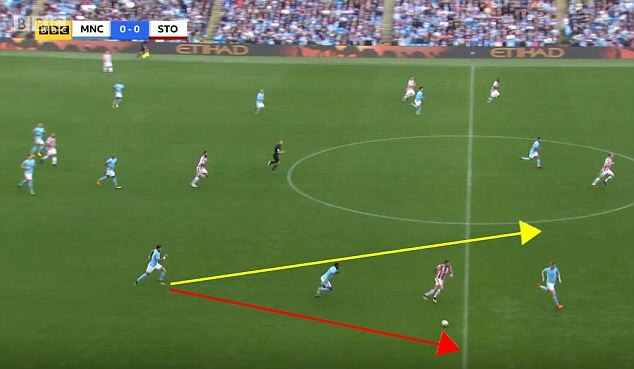 De Bruyne's pass for Sane against Stoke is a wonderful example of that. Sure, the German finds space behind the defence. Absolutely, he is slipping into that 'pocket' we've spoken about. But without his Belgian team-mate's exceptional vision and ability to play the pass, he would never have received the ball. Put the vast majority of Premier League players in the same position and he would not be able to play that ball. De Bruyne, as one of the best, can. Having those exceptional players is also clear from the stats. 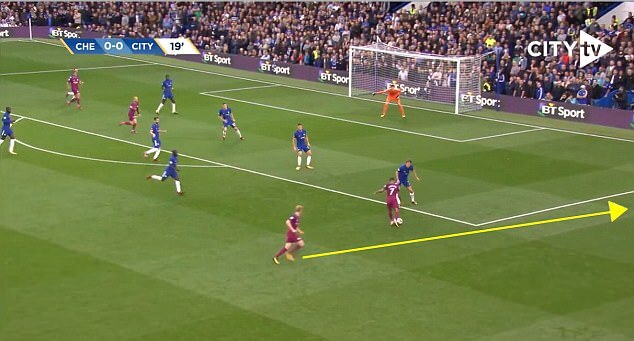 It is worth looking at De Bruyne's pass here again - who else would spot that run? Opta's new Expected Goals (xG) stat is a very good way of analysing the quality of chances a team creates for their players. If a player has an xG of six, you would expect him to have scored about six goals. Romelu Lukaku, for example, has an xG of 6.57 and has scored seven goals in the league, suggesting he is converting about the chances he should. City, on the other hand, have three players who have struck six goals. None of them have an xG of near six - Aguero is on 4.66, Jesus on 4.56 and Sterling on 3.62. The team also have the highest expected goals in the league, at 19.84, but that is far below the 29 they have struck. What this means is that up front, City have players who finish with a quality above the expectation. That applies to Jesus and Aguero. They are scoring more goals than they should based on the chances they have. Sterling in particular has shown a dynamic eye for a goal, converting chances that, per analysis, he isn't likely to. While this could simply be taken as evidence City have bought in players to win them the league, it ignores the fact that Sterling's key flaw since he broke through has been his finishing. It could just be chalked up to him becoming a more mature player. He is now 22 and broke through at a very young age. But the man himself credits his manager's coaching. 'Guardiola told me to just enjoy scoring goals, enjoy putting it in the back of the net and see it going in the net,' he said. 'Going in there [against Swansea] I made my mind up straight away what I was going to do and luckily it paid off. Guardiola makes these players better. He has taken De Bruyne and turned a very good winger into an exceptional central midfielder. Silva is better than ever before. The last two games aside, John Stones is keeping clean sheets. Jesus, a young Brazilian inside forward, is now one of the Premier League's best No 9s. Sterling has become a finisher. The Catalan coach has ideas and the players to put them into practice. His concepts are miles ahead of the rest of the division. It's no surprise that City are too. PS. 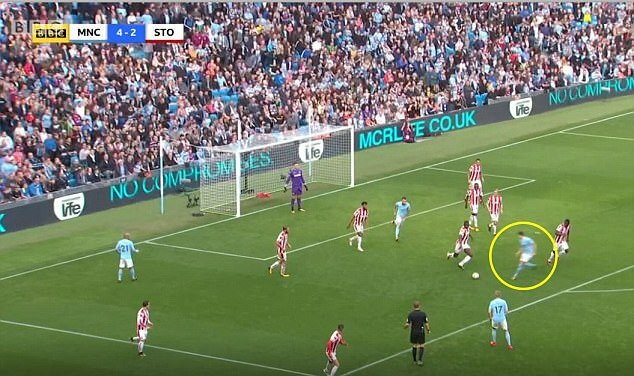 You might think a team like City would ignore set pieces. 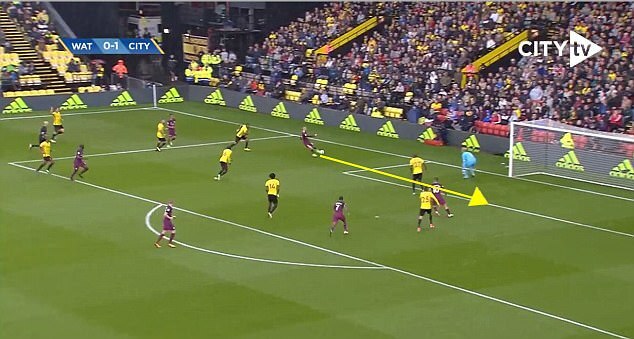 Against Watford they created two goals from corners. This is something Guardiola did at Barcelona - use set pieces to get early goals and then kill teams when they break forward to try and equalise.